A TRIAL DATE has been set for Anti-Austerity Alliance TD Paul Murphy and 17 other people facing charges of false imprisonment of then-Tánaiste Joan Burton following a water charges protest in Jobstown two years ago. Burton and her entourage had left a graduation event at An Cosan Education Centre at Jobstown, Tallaght when a demonstration was held which delayed her for about two hours on 15 November 2014. Amongst the defendants are Dublin Councillor Kieran Mahon (38) of Bolbrook Grove, Tallaght, Anti Austerity Alliance Councillor Michael Murphy (50) of Whitechurch Way, Ballyboden and Mr Murphy (33) of Kingswood Heights, Tallaght, Dublin. Judge Melanie Greally set three separate trial dates at Dublin Circuit Criminal Court today after she said she had grouped the accused together based on what charges they are facing. Paul Murphy, Michael Murphy and Mahon are due to be tried with four others, each of whom are charged with false imprisonment, on 24 April 2017. A pre-trial date has been set for 7 December. The second trial of six people accused of false imprisonment is due to take place on 2 October 2017 with a pre-trial date hearing for 8 June 2017. The final trial of five people accused of violent disorder has been set for 9 April 2018 with a pre-trial date set for 13 December 2017. Email “Paul Murphy will face trial over Jobstown false imprisonment charges next year”. 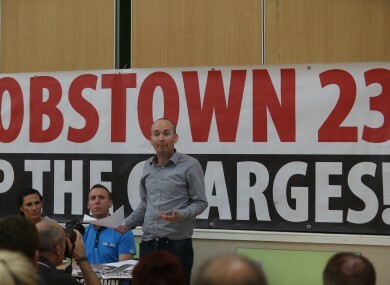 Feedback on “Paul Murphy will face trial over Jobstown false imprisonment charges next year”.